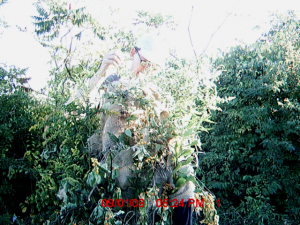 Dan and Hanna had decided to combine their interests by constructing camouflaging “ghillie suits” out of materials found on the island (Hanna) and building a “blind” out of reflective Mylar (Dan). Like the projects of the other artists’ groups who would be spending five nights camped out on Bumpkin Island within sight of the Boston skyline, Camoufleurs would give visitors a new perspective on the Boston Harbor and on the place of art in public spaces. It would raise questions about visibility and invisibility, surveillance and secrecy, nature and culture. When Hanna told me about Camoufleurs, I was struck by the project’s resonance with my own research on the surveillance of wildlife. 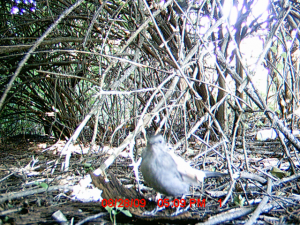 Even though my focus had been on wildlife radiotracking,2 I’d also been thinking a lot about the recent rise of cheap, ubiquitous “trail cameras” or “camera traps,” which are used by scientists, hunters, and wildlife enthusiasts to capture images of elusive animals. I suspected that these motion-activated cameras had a greater impact on the animals they were meant to photograph and on the humans who resided in or visited the landscapes where they were deployed than many of their users were willing to admit, at least on the record. Surveillance was the logical complement of camouflage, an effort to make visible what had been hidden. 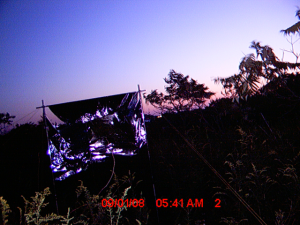 What if I put some camera traps of my own on Bumpkin Island? 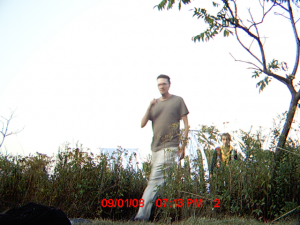 How would the presence of hidden cameras change visitors’ experience of nature and art on Bumpkin Island? How would it intersect with the questions about visibility and invisibility raised by Dan’s and Hanna’s interventions? Could I find some way to link the questions I had about the surveillance of animals to the surveillance of humans, without suggesting that the questions were exactly the same? Hanna and Dan both seemed excited about the possibility and graciously invited me to participate. The lack of funding put a limit on my technological ambitions, but for about $100 I was able to order two bare-bones trail cameras from Cabela’s, the hunting and outdoor sports megastore. During our five-night stay on Bumpkin, I spent most of my time helping to construct the blind, weaving my own ghillie suit, swimming off Bumpkin’s dock after the last ferry had left the island for the night, and enjoying the spontaneous community that emerged among the artists camping on the island. But I also took the time to place and re-place the two camera traps at the site where we were constructing the blind, near Bumpkin’s highest point, and at a few other, more secluded locations. Without a computer to download the images to, I had no idea whether the cameras were capturing anything of interest. I very quickly realized that my near-total ignorance of what kinds of animals were on the island and where they were most likely to be found was a serious flaw in my plan. Too busy thinking about the cultural big picture, I hadn’t taken the time to do my biological homework. I have to admit that when I got back to the mainland and looked through the hundreds of images and video clips the cameras had recorded, I was pretty disappointed. Except for the cameras that I had set up immediately at the site of our construction of the blind, which captured innumerable photos of myself, Dan, Hanna, and the rest of the team as well as a number of visitors, most of the shots seemed to consist solely of dirt, rocks, and plants. 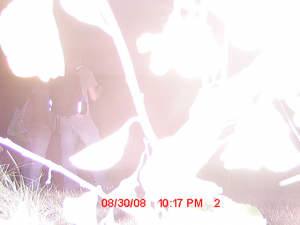 I could only speculate that the cameras had been triggered by animals or people that had moved past the infrared beam too quickly for my low-budget equipment to react. It was fun, in a theoretical way, to think that I had a collection of photos taken a second or two after some anonymous creature had passed by, but a lot less fun than an actual photo of one of the coyotes reputed to visit the island from time to time would have been.4 Even a bird or a mouse or two would have been some consolation. 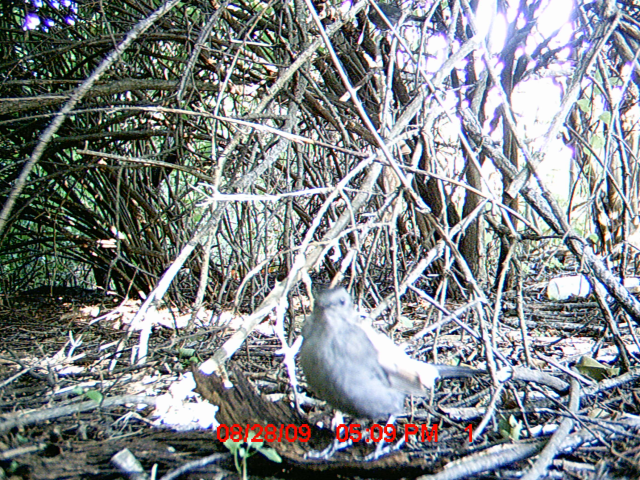 Actually, it turns out that the cameras did capture a bird or a mouse or two. I just hadn’t looked closely enough, or if I did, I was too focused on those coyotes to recognize the value of what I had. 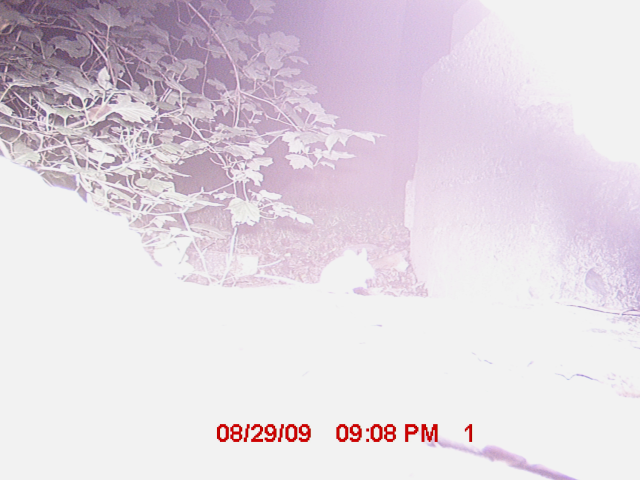 Looking at the photos now, a few years later, it’s a thrill to see even a blurry glimpse of a bird or the silhouette of an unidentified rodent. It makes me curious to know more. What kind of animal was it, exactly? What was it doing and where was it going when it was caught on camera? How had it reacted to the sound of the camera’s shutter or the light of its flash? I find something poignant in these brief, almost accidental photographs of animals going about their business: hints of lives that resemble our own in some ways but which remain alien to us no matter how much technology we use to peer into them. 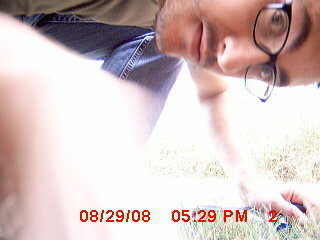 Looking back from the distance of a few years, that pretty much sums up how I feel about camera traps. They’re capable of producing amazing images that ultimately remind us of how little images alone can do. Like other forms of intensive surveillance of the natural world, they can produce an extraordinary amount of “data,” but I doubt that it’s data that we’re missing most sorely at this historical juncture. I’m not sure whether any of these ideas came across to visitors to our installation on Bumpkin Island, but I do know that everyone involved in the Camoufleurs project came away invigorated. There was something very gratifying about the way that our projects intersected with and built off of each other, both because and despite of their differences: Hanna’s ghillie suits, blending the human figure into the natural landscape through careful artifice; Dan’s blind, reflecting the experience of invisibility back on itself; my cameras, creating an atmosphere of aleatoric surveillance. It was a kind of experiment in collaborative work across the borders of art, technology, and science that I wouldn’t mind trying again. 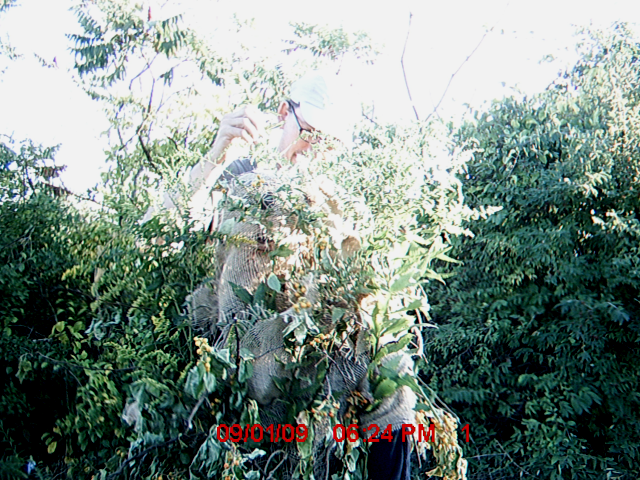 For more on the Camoufleurs, including some photos of higher quality than my trail cameras were capable of acquiring, check out this 2009 blog post by Dan Hisel.